The evaluation of i-THRIVE includes the evaluation of the impact of implementing THRIVE within localities, as well as the effectiveness of the translation and implementation process. A full scale evaluation funded by NIHR CLAHRC North Thames began in February 2017 to assess the impact of implementing THRIVE in the ten accelerator sites. This will be completed by the end of March 2019. Data on key site-level outcomes is collected at baseline and then quarterly for two years thereafter. As well as collecting data from the accelerator sites, site-level outcomes data is also collected at baseline and then quarterly from ten comparable non-i-THRIVE sites that have been matched for demography, resource and clinical variables. Collecting and analysing this data will allow us to evaluate whether implementation of THRIVE leads to improvements in the delivery of CAMHS services. The site level data collected is service performance data that directly relates to each of the five needs based groupings of THRIVE and to shared decision making. In addition to site level data collection, semi structured interviews based on the THRIVE Assessment Tool are undertaken with accelerator sites on a six monthly basis. This allows sites to assess how THRIVE-like their systems are at regular points and allows us to track progress made in the implementation of THRIVE principles that should underpin all service redesign. You can read more about the evaluation and the project team on the NIHR North Thames CLAHRC website. 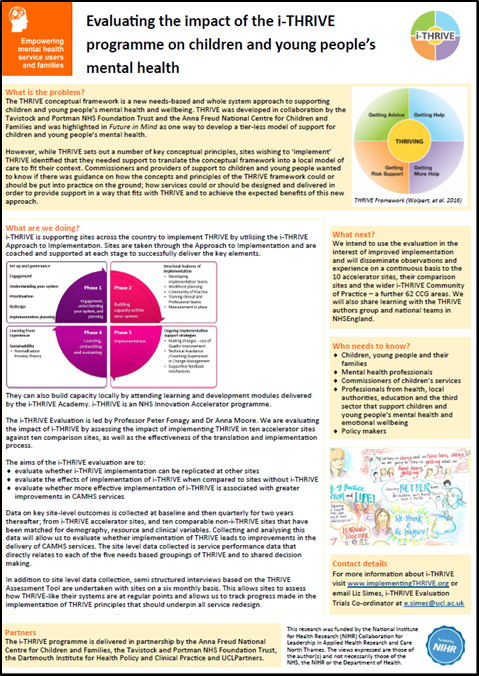 Click here to see a poster on the i-THRIVE Evaluation which was developed for the NIHR North Thames CLAHRC. To find out more about the i-THRIVE Evaluation project please contact Liz Simes, Trial Coordinator at e.simes@ucl.ac.uk.